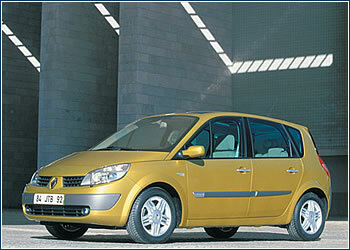 Seven years ago Renault launched the Scénic, a family car and the first compact MPV on the market. More than two million cars later, the new Scénic II is here to continue the campaign. 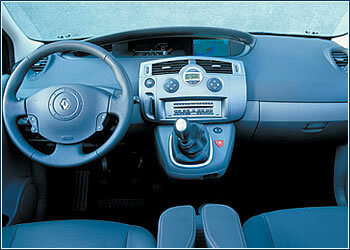 DISTINCTIVE at first glance, the Renault Scénic II features sharper lines and large glass body surface. Its length has been slightly increased to 4.26 meters, and thanks to its extended wheelbase it has more space for passengers in the back. When set up with five seats the Scénic II has 430 to 480 liters of luggage space (depending on the positions of the rear seats) but it can be converted into a two-seat delivery vehicle with 1,840 liters of cargo space. The three rear seats can be adjusted separately and can be moved 22 cm in line with the car, but they can also be folded down or even removed. There are also many discreetly located smaller storage spaces. New is the gear shift placed in the center of the dashboard module, and the Confort- and Luxe-equipped models also feature an automatic parking brake. The range of motors begins with a four-cylinder, 1.4 l, 98 hp (72 kW) gasoline engine, and continues with 1.6- and 2.0-l, 115 and 136 hp (83 and 98.5 kW) engines, and instead of the standard five-speed gearbox they can also be mated to the Proactive four-speed automatic. Two turbo diesels, the 1.5 dCi and 1.9 dCi (80 and 120 hp, 60 and 88 kW), are available, and there will soon be a more powerful version of the 1.5 dCi, tuned to 100 hp (74 kW). All Scénic II cars come with ABS anti-block braking systems with EBV braking power distribution and emergency brake assist, whereas the ESP chassis stabilization system is optional. Its passive safety features are borne out best by the fact that in crash tests conducted by the European consortium Euro Ncap the Scénic II was the first MPV in its class to receive the highest possible rating, five stars. Scénic II prices start at CZK 509,000, and the entire line consists of 44 various versions.